Due to enter the market in late 2006, the MINI Cooper is powered by a 1.6-litre normal-aspiration engine developing maximum output of 88 kW/120 hp, the MINI Cooper S comes with an even more powerful and dynamic 128 kW/175 hp turbocharged engine. The “basic” version, the new MINI One, will be following in the first half of 2007, its 1.4-litre power unit developing maximum output of 70 kW/95 hp. And finally the range will be joined, also in the first half of 2007, by the new MINI Diesel featuring the most advanced and sophisticated turbodiesel technology. The four-cylinder petrol engines come from a brand-new range of power units developed from a clean sheet of paper and boasting a number of highly innovative technical features. The interior is also brand-new in its design, while the exterior has been through a process of design evolution maintaining the unmistakable character of the MINI. Indeed, the specific features of the car’s body and interior now come out even more convin­cingly, clearly reflecting the typical character of the brand. And together with the modified chassis and suspension, the modern power units further sharpen the already legendary go-kart feeling so characteristic of the modern MINI. At the same time it is not only the design and drive technology of the new model, but also the wide range of standard equipment and the sophisticated finish, that make the new MINI so unique, reflecting the premium standard of the brand in every respect. 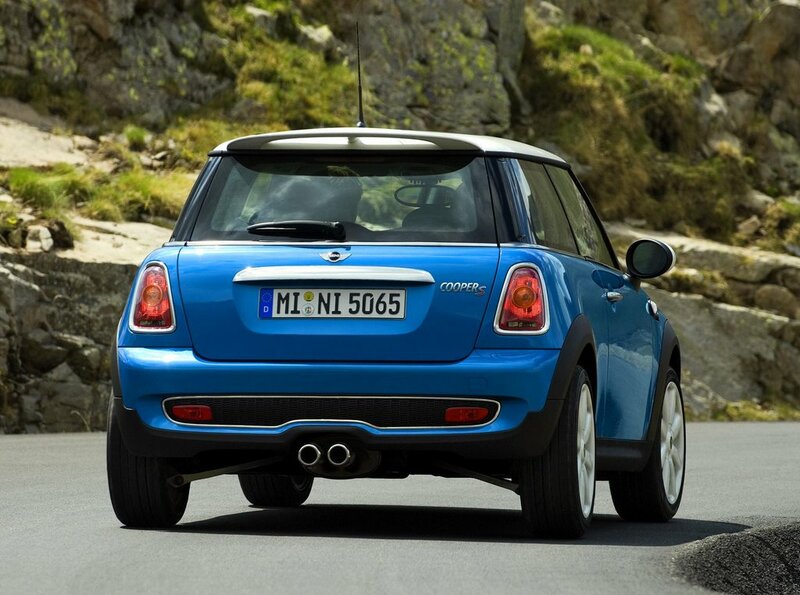 Even more distinctive than before: unmistakable features of MINI design. 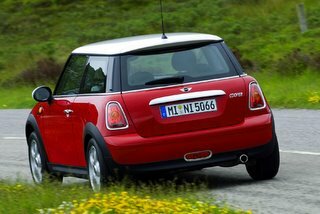 In its dimensions, the new MINI has grown slightly over the size of the first generation. The larger dimensions at the front serve inter alia to fulfil future safety standards and requirements, with the new MINI Cooper being 60 millimetres or 2.87´´ longer than its predecessor, the new MINI Cooper S 61 millimetres or 2.36´´ longer. In the words of MINI’s Chief Designer Gert Hildebrand, “we have set off this increase in size optically by working on various exterior details”. Following the philosophy of “moving from the original to the original”, Hildebrand and his team have re-designed the entire car while preserving and authentically updating the characteristic look of the MINI. As a result, the new MINI is characterised, as before, by short body over­hangs front and rear as well as large wheels highlighting the muscular sideline of the car. Features naturally retained are the unmistakable high­lights of the MINI such as the hexagonal radiator grille, the large, round headlights moved far to the outside, the complete “band” of glass stretching round the passenger compartment, as well as the diagonal seam between the engine compartment lid and the side direction indicators clearly bearing testimony to the welding seams at the same point on the classic Mini. And another feature virtually natural on the car is the size, position and arrange­ment of the upright, almost vertical rear light clusters. The front end of the new MINI is also characterised by the position lights and foglamps beneath the main headlights. Indeed, these additional light units serve as “beauty spots” in the face of the new MINI, while the direction indicator lights are now integrated in the headlight units themselves. The MINI Cooper S differs from the MINI Cooper inter alia through its even more muscular powerdome and its opening in the engine compartment lid. On both model variants, vertical air flow edges on the C-pillars and indivi­dual spoilers at the rear end of the roof enhance the level of aerodynamics to an even higher standard than before. The typical MINI Center Speedo re-interpreted. 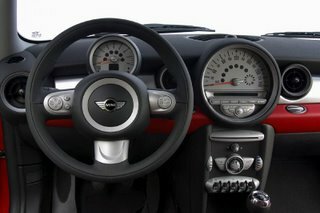 The changes in the interior design of the new MINI are far more significant than on the exterior. Both the design of the control units and the special sur­faces inside the car clearly symbolise the high level of technical excellence and the outstanding premium quality of the new MINI. The dominating geo­metric elements are circles and straight lines skilfully combined with one an­other, round instruments and air vents, for example, being arranged attrac­tively on the dashboard subdivided horizontally into three levels. This clear focus on clear shapes and design elements gives the interior a particularly sturdy, functional and purist, but also light and generous look. Sophisticated, high-quality materials and soft surface contours, finally, round off the characteristic ambience of the interior in the new MINI. The most striking and conspicuous feature within the cockpit of the new MINI is the Center Speedo even larger than in the former model. This cen­tral display and control instrument, acknowledged for a long time as an icon in the interior design of the MINI, has not only grown in size, but also in fun­ctional significance. Hence, the Center Speedo now comprises not only the analogue speedo­meter, but also all entertainment and, as an option, navigation functions. With the entire centre console becoming even slimmer and more subdued as a result, the footwells are correspondingly larger. The door and ignition key, finally, is now a round signal sensor in typical MINI design, with the driv­er pressing a start/stop button to switch the engine on and off. New petrol engines, complete range of safety features. Displacing 1.6 litres, the four-cylinder turbocharged power unit of the MINI Cooper S now develops an even more impressive 128 kW/175 hp, the right kind of power to turn the MINI Cooper S into a truly outstanding experience in motoring fun. The engine is boosted in power by means of a twin-scroll turbocharger driven by the separate emission flow from two cylinders at a time. As a result, the turbocharger serves to boost engine power significantly from low engine speeds, providing a truly impressive effect: The 1.6-litre four-cylinder featured in the MINI Cooper S accelerates the car with the kind of power and performance otherwise to be found only in much larger normal-aspiration models. The MINI Cooper also boasts a 1.6-litre power unit, this time, however, with normal aspiration and maximum output of 88 kW/120 hp. Intake valve con­trol featuring the BMW Group’s unique VALVETRONIC technology is fully variable, valve stroke and opening times being adjusted infinitely and with electronic management to the respective power requirements. This innovative valve control ensures not only a particularly high standard of respon­sive­ness and superior motoring refinement, but also superior fuel economy and optimised emission management. 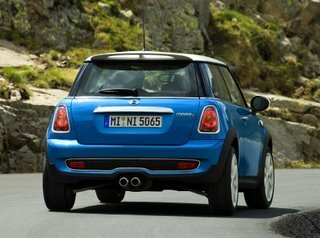 Compared with the MINI Cooper, the chassis and suspension of the MINI Cooper S is a lot firmer and more dynamic. And as an option both models are available with sports suspension for an even higher standard of fun and enjoyment at the wheel. 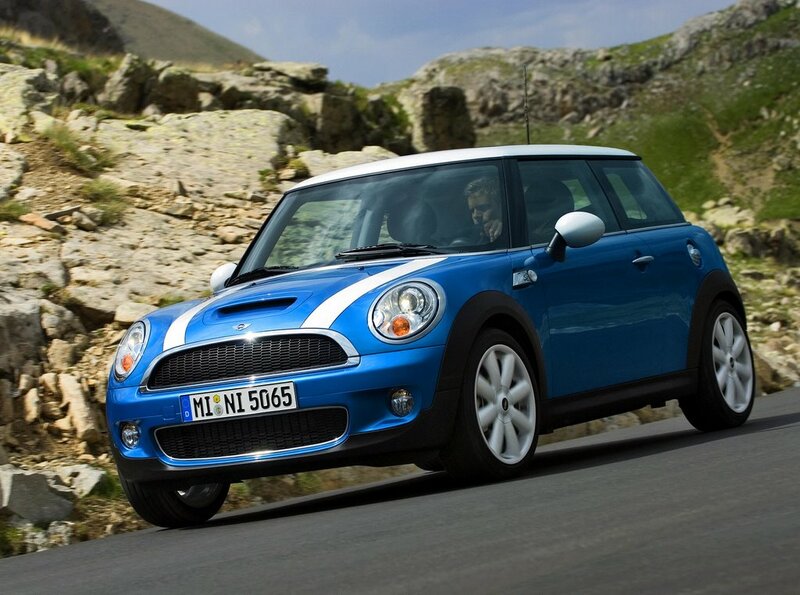 Reflecting the MINI’s commitment to premium, both models come with a wide range of safety features. Six airbags, for example, are naturally fea­tured as standard to ensure comprehensive occupant protection on all seats. Active safety of the highest calibre is ensured in critical situations, in turn, by ABS anti-lock brakes, EBD Electronic Brake Force Distribution, CBC Cornering Brake Control, ASC+T Automatic Stability Control + Traction standard on the Cooper S and with on-off control by the driver, as well as DSC Dynamic Stability Control. The Brake Assistant in the new MINI reliably detects application of the brakes in an emergency and builds up maximum brake pressure at the fastest conceivable rate. Yet another new function is Hill Assist uphill starting-off assistance combined with DSC, which activates the brakes when setting off on a gradient to prevent the car from rolling back. The new MINI takes up the overwhelming success of its predecessor already accounting for sales of more than 800,000 units and immensely popular among a growing community of MINI aficionados the world over. And applying the high standards of quality, technology and safety con­sist­ently upheld by the BMW Group, the new MINI, more than ever before, underlines its claim to leadership in this segment.